Got a mixed breed? Ever wonder what breeds make up your dog’s heritage? You’re not alone! Hundreds of thousands of people have submitted DNA of their dog to identify what breeds make up their dog’s heritage. There are plenty of reasons people want to identify the breeds in their dog. It’s kind of fun to guess the breeds based on what the dog looks like and how she behaves, but it’s even more fun to really find out what breeds actually contributed to your dog’s DNA. While we can guess all day, there’s nothing like a DNA test to give accurate results. It’s fun to see if your dog’s howl really is from her hound heritage or if it’s just a cute peculiarity that has nothing to do with her ancestors. Behavior is linked to genetics. Back when dogs had jobs, genetics were important. A farmer needed a reliable dog who could bring the herd or the flock in. Border Collies herd so well because back in the day, the ones who didn’t herd weren’t bred — their genes didn’t go any farther. Labradors are social because they were selected for their friendliness and their love of retrieving. If someone had a shy or anti-social Labrador who wouldn’t enjoy sitting in a duck blind or who wouldn’t fetch a bird in the water, that dog’s genetics didn’t go any farther. Today, most dogs are pet dogs and they don’t need to do the job for which they were bred so many centuries ago. But knowing what breeds are in your dog can give you an indication on how she might behave, or could help explain why she does that peculiar thing (whatever that might be). Having just lost a dog to dilated cardiomyopathy (DCM), I place a high degree of importance on genetics. If I had a dog who I suspected might have Great Dane (or Doberman or any of the other breeds significantly impacted by DCM), I’d do a DNA test right away. Knowing the breed-specific heath risks is important so you can keep an eye on — and hopefully catch a health problem early. There are quite a few companies out there that do doggie DNA testing. More than a decade ago, we did a DNA test of Nemo. I was unimpressed with the results and now I wish we’d have repeated that test when he was older, as the tests have gotten more sophisticated over the years since we tested Nemo. My parents got a mixed breed dog from the local shelter almost a year ago. A pretty little thing, Nautique has been a great addition to the family. She’s medium-sized, brindle and white coat, and sweet as sugar. She’s a real love bug with people as well as with other dogs. She was a great playmate for Schooner and really enjoys playing with Walter. She’s got a timid side if she’s meeting new people, particularly men, but that’s probably due to lack of socialization when she was a puppy and not necessarily breed related. She was listed in the shelter as a hound mix. We’ve had fun guessing the breed mix over the past year. Then DNA My Dog sent an inquiry asking if I’d be interested in trying out their DNA test. We, of course, had just lost all our dogs over the past year. And they were all pedigreed dogs (except Neems, of course), so I had initially dismissed the offer. I was telling my husband about it over dinner, lamenting that Nemo was gone because wouldn’t that be fun to try another DNA test with him, when he mentioned Nautique. “Of course,” I said. What a great idea! I told the company to send the test out, I’d be happy to give it a try. In general, DNA tests for dogs can be done with a blood sample or with saliva. Collecting blood requires a trip to your veterinarian, but it’s fairly easy to collect a clean saliva sample at home. DNA My Dog sent collection material and easy-to-follow instructions. An important consideration when getting the saliva sample is to make sure the dog hasn’t eaten or played with another dog within an hour of sample collection. They send a pre-paid addressed envelope to return the sample. It’s pretty darn easy. The sample collection kit comes with it’s own personalized reference number. After you collect the sample and put it in the mail, you can check the status of the sample online at the DNA My Dog website. It does take some time to get the results. It took about a week for the sample I sent to arrive and show up in the online tracking database. Then the actual test takes about two weeks to complete. I checked the website every day looking to see if Nautique’s results were ready. DNA My Dog sends an email when the tests are done (so you don’t really have to be a nut and check every single day like I did) with the full report of the different breeds they found in your dog. The report contains the”levels” of the breed identification from Level 1 (your dog had a purebred parent) to Level 5 (9% or less of that breed shows up in your dog — probably carried over from several generations ago). The report includes a breed analysis with the breeds that were identified in your dog’s DNA (Level 1 through Level 5), a certificate with your dog’s name (and picture, if you submit on through their website), and instructions on how to register for a free “Life Plan” based on your dog’s DNA results. Weight predictions for puppies PLUS a weight monitoring service you can use to manage your dog’s weight and nutrition requirements at every stage. This invaluable tool is designed to allow you to keep track of your dog’s weight and to work with your veterinarian to ensure you dog is always at an optimal weight. Keeping your dog at a healthy weight is one of the easiest ways you can contribute to the wellness of your dog. Nutritional guidelines specifically for your pet including daily energy requirements based on your dog’s age and activity level. Staying on top of your dog’s nutrition is an effective way to keep your pet healthy. A handy reference enabling you to note all of the food your dog eats, how much is fed and reactions your dog may have to specific foods. Guidelines on the types of food available for dogs and what you must know before selecting a specific diet for your dog. Hydration guidelines and other advice to guide you through nutritional decisions for your dog. Various Health Alert signs you must be aware of. Alerts to help you keep track of routine care, disease screening, appointments and anything else you need to manage your dog’s wellness. Specific health recommendations based on the current state of your dog’s health. A handy place to store all of your dog’s information including microchip numbers, grooming information, veterinary details and other important resources you need to keep handy. Nautique’s results show that she’s got American Staffordshire Terrier (Level 2), Redbone Coonhound (Level 4) and Bloodhound (Level 4). Regardless of what breed mix she is, we all love her to pieces and wouldn’t change a thing about her. DNA My Dog is based in Canada and has 94 breeds in it’s genetic database. In addition to DNA tests for living dogs, they also offer DNA testing for deceased dogs. The sample collection for a deceased dog is dependent on the availability of a clean saliva sample, say from a doggie toothbrush. The test for a deceased dog is more expensive, as the company needs to collect the DNA from the toothbrush or slobber-laden toy. Interestingly, they also offer a DNA test for wolf-coyote hybrids. The test determines whether a dog has any recent non-dog ancestors through contact with a wolf or coyote in the wild by accident, or through intentional breeding. According to an article from September 2017, DNA My Dog doesn’t support intentional breeding of hybrids, but the company has seen significant demand for a genetic test for hybrids. Overall, DNA testing is fun and informative, and relatively inexpensive. The DNA My Dog genetic test is $68.99 for the basic test. There are other more complex tests to choose from that run from $99 – $188 depending on the complexity of the test and the information that is provided. 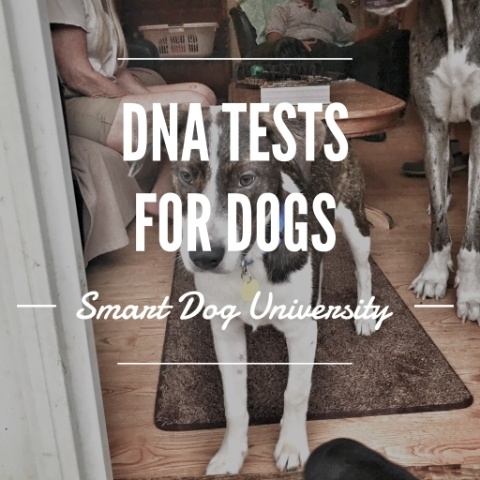 Have you done a DNA test on your dog? What did you think?